Practice MATLAB questions and answers for interviews, campus placements, online tests, aptitude tests, quizzes and competitive exams. This set of MATLAB Multiple Choice Questions & Answers (MCQs) focuses on “Algebra”. 1. What is the difference between syms ‘x’ and sym ‘x’? Explanation: sym ‘x’ makes the declaration short lasting. If it is assigned to a variable, x say, the function is equivalent to syms ‘x’. This makes syms ‘x’ long lasting. 2. What is the nature of the arrangement of the coefficients to store the following expression in MATLAB? Explanation: To enter the co-efficient of a polynomial, the variable terms are arranged in descending order of the power of the variable. It cannot be a column vector. If the descending order is not consecutive, one has to put 0 within the row vector to indicate that the co-efficient of the missing order is zero. 3. In the function vpa(‘981’,10), why do we put 981 within inverted commas? Explanation: Variable precision arithmetic in MATLAB is perfected by computing exact values and exact values are evaluated if the numerical expression is within a string. By not placing the pair of inverted commas, we get a floating point approximated value. Explanation: Option simplify(log(x20)-log(x13)–log(x7),’IgnoreAnalyticConstraints’,true) would evaluate to 0. The cases are used to produce a greater simplified expression for a polynomial. simplify(log(x20)-log(x13)–log(x7)) does not give any different output but the expression itself. Option log(x20) – log(x13) – log(x7) is incorrect since the powers should be represented as log(x20) in MATLAB. 5. What happens if we don’t assign a variable to an expression which evaluates a numerical value? Explanation: This is common for MATLAB. The evaluated numerical values are assigned to a variable ans if there is no body in the right hand side of a numerical expression. So the options MATLAB shows error is false. 6. MATLAB sees a ________ ordered variable as a vector of dimension n*1. Explanation: The row vector which consists of the co-efficients of variables of a (n-1)th ordered polynomial in descending order is an nx1 vector where the last term is a constant term of the expression. The rest of the options are incorrect by the above statement. 7. What will be the output for the below block of code? Explanation: The function roots(p) generate a column vector, and not a row vector, containing the roots of a polynomial. So option a and b cannot be the answer and there is no error in the code. The answer is option d.
8. Name the functions used, for multiplication and division of two polynomials in MATLAB. Explanation: Multiplication in a time domain is convolution in a frequency domain. This is the reason for the existence of MATLAB functions conv(), for multiplication of signals, and deconv() for division of signals. There are no functions like mult() and div(). 9. How can the formulation of polynomial be done from its roots? Explanation: To find the roots, one has to store the given roots in a 1*n column vector, say p, and then extract the co-efficients of the polynomial by typing poly(p). This would return the co-efficients of the polynomial in descending order from left to right. Explanation: polyder(p)and polyint(p) produces the differentiation and integration of the polynomial p. Polyval(c,a) is the correct form of the function to evaluate the value of a polynomial whose independent variable is a. The value of a has to be provided first before writing the function. 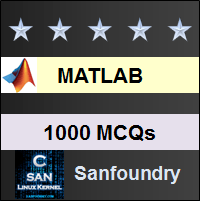 Sanfoundry Global Education & Learning Series – MATLAB. To practice all areas of MATLAB, here is complete set of 1000+ Multiple Choice Questions and Answers.